4 piece shower with "Eight Inch” tile finish, 1-3/4" threshold, integral shelves, and end drain. 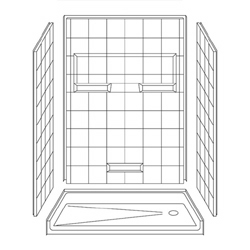 Bestbath Four Piece 54" x 30" Barrier Free Shower provides easy walk-in or roll-in shower access for seniors and persons with disabilities. This shower unit features an "Eight Inch" tile accented finish, 1-3/4" threshold and left or right hand drain. The strong, luxurious polyester gelcoat composite fiberglass shower is built with full plywood backing on all walls for outstanding strength and customized installation of accessories. The self-supporting pre-leveled bottom eliminates mud setting. Easy, snap-in-place installation from the front. No grout cleaning and easy care finish. No tiles to fall off. Luxurious gelcoat finish also available in custom colors or with custom accent tiles, call for details. 30 year limited warranty. Made in America. Dimensions: 54" x 30" x 79"